Loyalty programs have been an effective method of marketing for most businesses that adapt it. The concept of loyalty has been used in business for over 200 years. Here is a timeline of what we know to be the evolution of loyalty throughout the years. The first known use of loyalty marketing was in 1793 when a U.S. merchant began handing out copper tokens which customers could then collect and use to redeem merchandise in store. The idea caught fire, and was used by many other merchants throughout the next century. In 1872 the Grand Union Tea Company began giving out tickets to their customers that could redeem merchandise from the company's Grand Union store catalogs. In 1886, the Larkin Company sold sets of a variety of soaps that included certificates that could be redeemed from the company's catolog. Soon marketers turned to the stamp method to retain loyal customers. Customers were given trading stamps when making purchases that they then pasted into booklets also given out by the company. When customers had a certain amount of filled booklets, they were able to exchange them for many different types of goods, including jewelry, tools, toys, sporting goods, household items, etc. This method was the most popular in the late 19th century and early 20th century. A department store in Milwaukee was the first to use the stamp method in 1891, which offered in store goods for the stamps. But in 1896 the Sperry and Hutchinson Company was the first to offer trading stamps as an independant company. 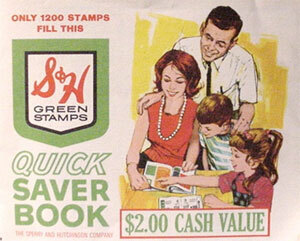 S&H began offering Green Stamps that year to different types of merchants in a community, along with the booklets to paste them in, and began opening their own stores known as "redemption centers" where merchandise was purchased solely in exchange for the company's stamps. Betty Crocker began issuing coupons in 1929 that were used to redeem premiums like flatware. In 1937 they started printing the coupons on the outside of packages, and became known as box tops. Betty Crocker later produced a popular rewards catolog that customers could choose to redeem items from using their points. Starting with American Airlines, Frequent Flier Programs came into existence in the early 1980's. A few years later, Discover was able to offer cash back programs where cash was given at the end of every year depending on the amount purchased that year. Technology could finally track customer behavior when Tesco (a UK supermarket) started using the first card-based loyalty program. In 2002, loyalty programs started becoming based on preferences of the customer. A year later, Best Buy offered a points earning structure, in which $1 = 1 point. After a certain number of points, customers would receive a dollar amount in the form of a certificate that could be used for future purchases. In 2009, Starbucks began a loyalty program based on frequency of visits. Today, we still see customized loyalty, as well as points and club programs. There is much more member communications through email, text, and mobile app push notifiations. Mobile apps have become big for companies that are large and offer value through the app for something other than just a loyalty program. The future of loyalty remains a mystery. Will it include mobile wallets? There will probably be more personalization of offers based on the customer preferences and habits. Possibly a more advanced technology integration? As technology advances, loyalty programs will evolve to enhance the customer experience. What do you anticipate for the future of loyalty?